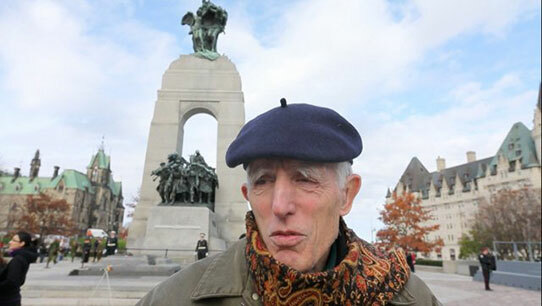 We asked Canadians gathered at the National War Memorial in Ottawa: What does Remembrance Day mean to you? OTTAWA—Justin Blanchet, 7, was not yet born when his grandfather died, but he knows enough about the soldier and his contribution to the Second World War to be grateful for his service. “Thank you, soldiers,” said Justin. The boy, who took the train with his parents from Barrie, Ont., was one of many Canadians nationwide who came to visit the National War Memorial on Monday. Tens of thousands of people are expected to gather for the Remembrance Day ceremonies Tuesday morning. They shared their thoughts of what Remembrance Day means to them. Bill Rolph, 75, said that while he did not know much, growing up, about two uncles — Staff-Sgt. Robert Cowen Rolph and 1st Lt. William Wilson Phillips Jr. — who died in the Second World War, he has come to learn their stories as the “family archivist” by reading letters and other documents related to their service. “They were really good men. They inspired, they were leaders,” said Rolph. Rolph said they are not the only soldiers he is honouring this Remembrance Day, adding he also wants to pay his respects to Warrant Officer Patrice Vincent, who died after being struck by a car in St.-Jean-sur-Richelieu, Que., apparently in a targeted attack, and Cpl. Nathan Cirillo, who was shot and killed at the National War Memorial last month while standing guard there. “I really feel strongly about honouring them and giving tribute and a thank you for their way of life and how their duty and their loyalty and those kinds of things drove them in their lives. It’s an entirely different kind of leadership that we all can develop ourselves, personally,” Rolph said. 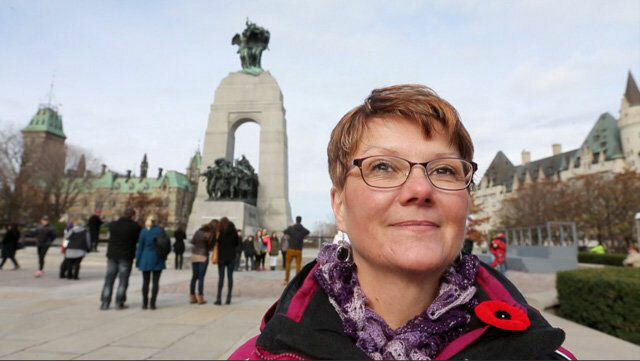 Deana Russell shares the importance of Remembrance Day. 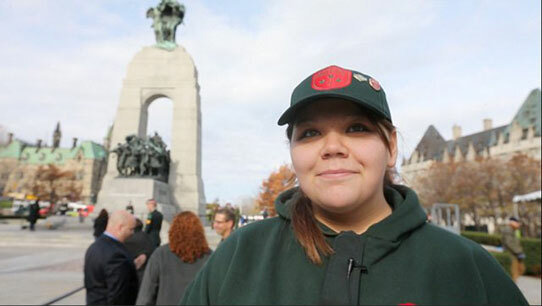 Deana Russell, 17, who was selected by the Junior Canadian Rangers to participate in the Remembrance Day ceremony Tuesday, came all the way from Port Hope Simpson, Labrador. “What it means to me is remembering all those who have fought for us, and just keeping their memories alive in our hearts and remembering what they did for us and sacrifices that they made, not only for us but for our country,” Russell said. Joochee Chung, 16, from Vancouver, will be representing the youth of Canada at the ceremony. 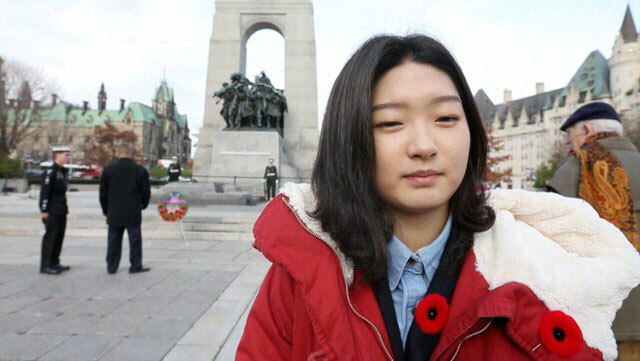 “I think it’s the connection between past and present, and really appreciating the sacrifice that people made,” Chung said of the meaning of Remembrance Day. 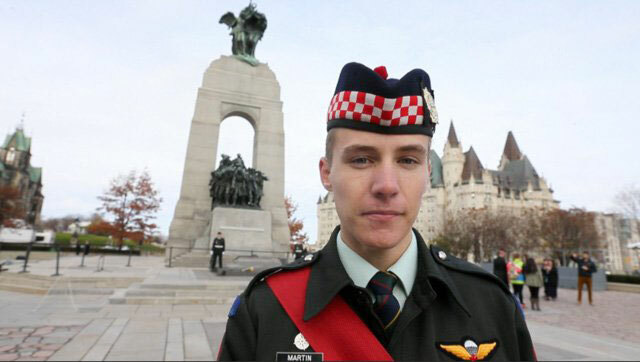 Teegan Martin, 18, from the 3016 Calgary Highlanders Army Cadets Corps in Airdrie, Alta., will be laying a wreath at the National War Memorial on Tuesday, on behalf of Veterans Affairs Minister Julian Fantino. “It’s a time of remembering, reflecting and honouring our veterans who have fought for us,” said Martin, who this summer was named Canada’s most outstanding army cadet. “Being able to live in a country that is free and democratic as we do, it is truly an honour to be here today,” Martin said. Jackie Ficht, from Edmonton, visits the War Memorial. Jackie Ficht, was visiting from Edmonton, Alta., to see her sea cadet son, David, 17, take part in the ceremony. “We do a lot of work with the veterans, so we have got to know a lot of them as family members, and unfortunately we have seen some of them pass away, so it has a lot of emotional meaning for us,” said Ficht. “We have a free country. We are able to have a democratic type of society and just (have) a lot of choices in our lifestyle,” Ficht said, when asked what Remembrance Day means to her. “Everything we do today is because of them,” Wyatt May said of Canadian veterans. 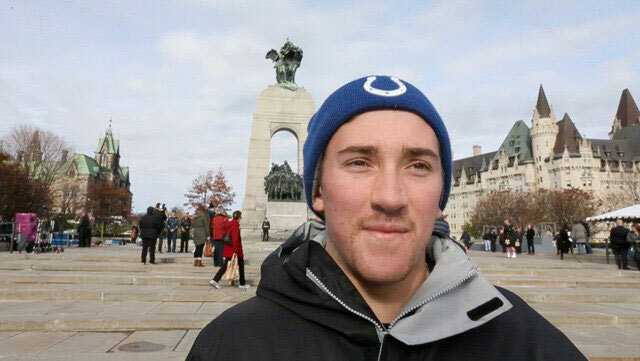 Wyatt May, 19, a Carleton University student in Ottawa, was selling poppies in front of the National War Memorial Monday. “Everything we do today is because of them,” May said of Canadian veterans, including his grandfather, who he said joined the military shortly after the Second World War. “He would tell me stories about the military and stuff like that, and that’s how it touched me deeply. And that’s why I’m selling poppies here today,” May said.